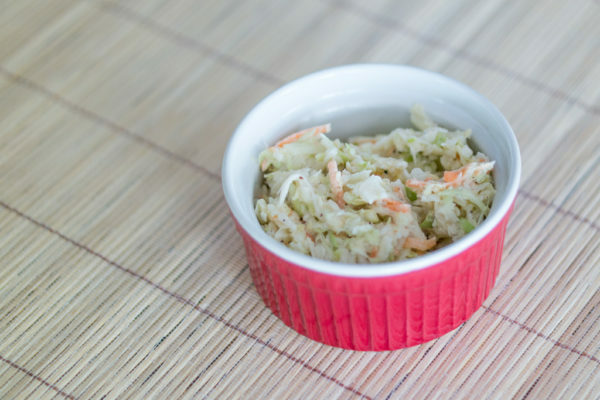 This cole slaw recipe brings back childhood memories of Friday nights at Mississippi fish camps. The slightly tangy and slightly sweet cole slaw was always served first before the fried fish, french fries and hush puppies. Saltine crackers in individual cellophane packs were on the table to eat with the slaw. Cole slaw was also a staple at any southern barbecue. Essentially, a fish camp (or catfish house) was a restaurant serving fried catfish, french fries, cole slaw and hush puppies. Some fish camps additionally offered boiled- or fried shrimp on the limited menu. Fish camps were generally located in a rural area, sometimes near a body of water such as a pond, lake or stream. There was nothing fancy about a fish camp and the building could be anything from an old house to a concrete block structure. The menu was usually painted on a big sign hung on the wall; tables and chairs were of the commercial folding type. Food was served family style in bowls and on platters at the table along with big glasses of sweet iced tea. If one wanted more of any food item, all they had to do was ask their server. Mix the cabbage, carrots and onions in a large bowl. In a smaller bowl, mix all of the other ingredients to make a smooth dressing. Pour the dressing over the vegetables and toss until well coated. Cover and refrigerate the cole slaw for at least 30 minutes to an hour before serving. Stir again before serving. Goes great with tuna cakes.